I joined the US Army at age 15 years and then was transferred to the US Army Air Corps which later became The US Air Force. I retired in March 1966 after 20 years of active service. I write for The Veterans Voice Newspaper, “vetsvoice” (all one word online) and you can share some of my stories on the front page of that electronic version. I also write for other newspapers now and then and in our spare time my wife Dottie and I have helped to name several memorial efforts for our military. Mount KIA/MIA, in south central Colorado was named to honor all of America’s killed and missing uniformed armed services personnel, dating from the birth of our nation. The mountain is a bit over 11,200 ft high. To read about it just type in Mount KIA/MIA plus my name online. 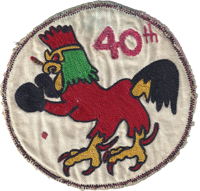 The 6th Bombardment Wing, Medium was established on December 20, 1950. 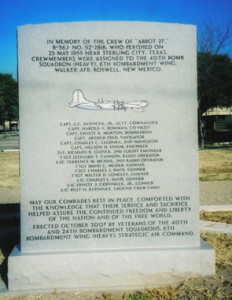 It was activated on January 2, 1951 at Walker AFB, NM. It then flew the B-29 Superfortress. In August of 1952, it received the new B-36 Peacemaker and the unit was redesignated the 6th Bomb Wing (Heavy) . The B-36 was flown by men of the 24th, 39th and 40th Bombardment Squadrons. Conducted strategic bombardment training from activation in 1951 until 1 Sep 1959. The 6th was deployed at Andersen AFB, Guam from October of 1955 to January of 1956. 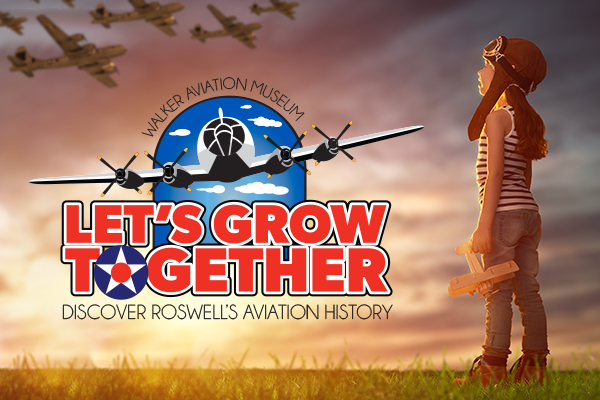 On August 1, 1951, the 307th Air Refueling Squadron was attached to the wing. It flew KB-29 tankers until deactivated June 16, 1952. On June 25, 1965, the 310th Air Refueling Squadron was attached to the wing. It flew KC-135s. The 597th Strategic Missile joined the wing on Sept. 1, 1961. It’s men manned the newly installed complex of Atlas missiles. 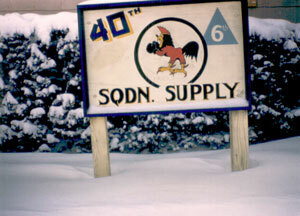 Operations were phased out in February 1965 and the missile squadron was inactivated March 25. The 6th Strategic Air Wing ceased B-52 operations in early 1967. The wing was moved without personnel or equipment to Eielson Air Force Arkansas On March 25, 1967. There it was redesignated as the 6th Strategic Wing. It replaced the 4157th Strategic Wing and assumed the resources and missions of that wing. In Alaska, the wing flew RC–135 strategic reconnaissance missions with an assigned squadron, and, with KC–135s deployed to Eielson from SAC, AFRES, and the ANG, conducted Alaska Task Force (ATTF) missions to support reconnaissance and numerous exercises for the Air Force and Navy. From Apr 1968 to Jul 1972 the wing periodically served as the airborne monitor of the Alaskan ballistic missile early warning station. The wing maintained a detachment at Shemya AFS, in the Aleutians, and operated from there February through May 1975, and again in June – September 1976, when Eielson was closed for repairs due to earthquake damage. It was redesignated the 6th Strategic Reconnaissance Wing on April 1, 1988. During this time it flew the RC–135 and TC-135. The 24th Strategic Reconnaissance Squadron left Eielson AFB on July 7, 1992. The wing has lost it’s operational mission and was inactivated on September 1, 1992. Redesignated the 6th Air Base Wing on December 22, 1993. It transferred to MacDill AFB, Florida on January 4, 1994. Redesignated 6th Air Refueling Wing on 1 Oct 1996.
used until inactivated on Jan 25, 1967. 30 BS: Attached Jan 2, 1951 – Jun 15, 1952, Assigned Jun 16, 1952 – Sept 15, 1963. Equipped with B-52E from December 1957 and used until inactivated on September15, 1963. B-52E from December 1957 until inactivated January 25, 1967. 307 AR: Attached Aug 1, 1951 – Jun 16, 1952. 310t AR: Assigned: Jun 25, 1965 – Jan 25, 1967. 6 AR: Assigned Jan 3, 1958 – Jan 25, 1967. 597 SM: Assigned Sept 1, 1961 – Mar 25, 1965. 4129 Combat Crew Training: Assigned Aug 1, 1959 Sep 15, 1963. Flew B-52E.